We all know the type: the B-Bomber. They’re the ones who love to use annoying Business Buzzwords – also known as corporate claptrap - in place of simpler phrases. The trouble is, the more the rest of us hear this jumbled jargon, the easier it is to accidentally slip a B-Bomb into our own work. And make your colleagues cringe. 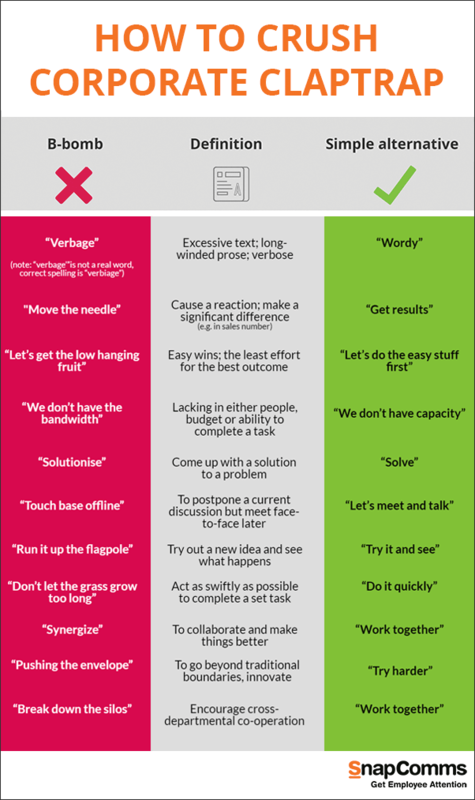 Below are some common business phrases broken down with simple alternatives to try. Research by the Institute of Leadership and Management has found that a quarter of workers find corporate jargon to be a "pointless irritation." Still, B-Bombs are used in more than two thirds of offices. B-Bombs can cause confusion among cross-cultural and cross-generational workplaces. Staff don’t always understand the same references, especially if English is not their first language. For example, phrases such as “boiling a frog” (a slow build), “ham fisted” (clumsy), or “playing chicken” (staying on a chosen course despite increasing risk) can bamboozle people. To help crush corporate claptrap, here’s a short-list of what we at SnapComms consider to be the worst offending buzzwords; their supposed meaning; and a suggested alternative. For further tips on how to simplify things in the workplace, we recommend visiting www.plainenglish.co.uk – an independent body intent on making business communications crystal clear. 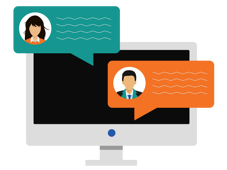 Also take a look at www.commstools.com – a useful directory which lists a multitude of ways to communicate with employees. To conclude, when in doubt, just remember that simpler is better. Be clear with your questions and you’ll get the concise, straightforward answers you’re looking for.